Latency and HPC Workloads - Why not SRAM? > be comparable to RLDRAM? > > May be it shouldn't. > Cypress 144 Mbit devices. $200 apiece in a lot of 500. > comparison, 576 Mbit RLDRAM will cost you $40 in a lot of 1,000. > > will give you higher bandwidth per pin. > a real density comparison. Intel does not sell SRAMs, except in form of cache in their CPUs. > be a good trade off for some applications. 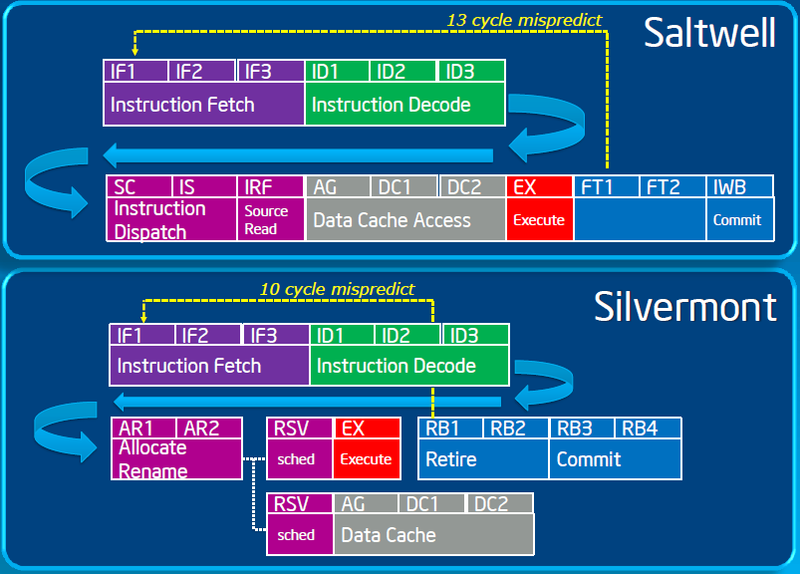 For given number of interface pins SRAM will not give you better sequential read/write bandwidth than commodity SDRAM. Even matching dual-ranked commodity DDR3 SDRAM with OTS SSRAM does not look possible. And of course, another DDR3-based commodity tech, GDDR5, has bandwidth that is factor of 3 better yet. At low capacity per pin SRAM will give you better latency. But low here means *really* low. Something like 16Mbit per databus pin. Above that, every quadruple of capacity will cost you 3-5ns. On the other hand, commodity DDR3 UDIMM gives you 1 Gbit per databus pin. Just to be withing factor of 4 of that you will have to do 2 quadruples = 6-10ns. So, you will end up with latency that is better than commodity DRAM page miss, but somewhat worse than commodity DRAM page hit. Now, if you want to pay another 3-5ns to quadruple capacity once more, you can't, because you already filled up all the real estate in proximity of your processing element. So you will have to go off-board, which costs, may be, 30ns instead of 3-5ns. On the other hand, with commodity you have an option of quadranked registered DIMMs that allows you to increase capacity by factor of 8-12, at cost of less than 10ns in latency and factor of 1.5 or so in bandwidth. It simply does not compare. Fast dense SRAMs are insanely expensive. Relatively to commodity DRAM you will be lucky to find SRAM which is, per bit, only 200 times more expensive, but factor of 500 appears more real.